Maui Jungalow: 10 Cent Books on Maui! Maui Friends of the Library bookstore in Pu'unene. Books and magazines outside are free. Update 2013: Most books are now 25 cents. Ah, inflation. It's still a great price. Some newer books are more expensive. 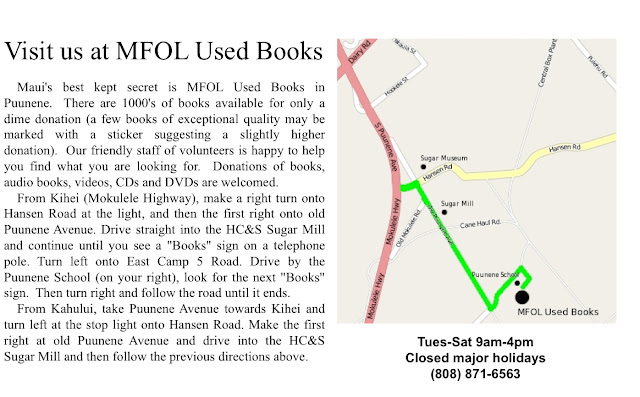 The best little bookstore on Maui is also another best-kept secret, although the volunteers at Maui Friends of the Library would like you and all your friends to know where to buy books and donate books. These are old-fashioned books, for old-fashioned hands, nothing Kindle or E-reader-operated. Almost all the books are 10 cents. No kidding. There are some exceptions. Just this past year, the newer hard back books from 2011 are $3. The 2010 books are $2... There is one shelf of collectible books, big coffee table style books with pretty pictures that also is more expensive. But almost all the paperbacks are 10 cents. Almost all other hardbacks are 10 cents. Besides books, there are magazines. There are numerous issues of Oprah, Real Simple, or Martha Stewart Living. There are shelves of free magazines and books in front of the store, outside on the porch. One can also find sheet music, occasional video tapes, CDs, software and DVDs. Towards Christmas, there will be an entire section of holiday related books. For $5, one can easily fill a box of books. I try to stop there once a month to get books for my mother, who is a voracious reader, especially of British mysteries. 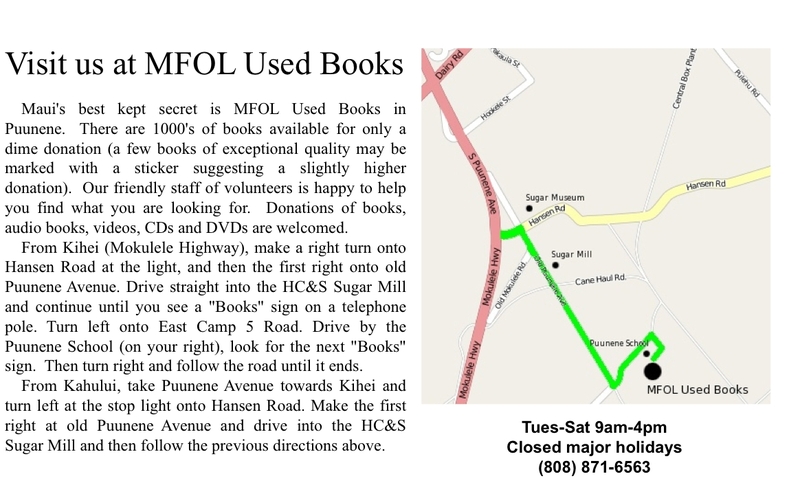 Recently, the MFOL store held a special three-weekend book sale in Kahului, to sell the remaining inventory from the now-defunct Old Lahaina Book Emporium. MFOL scrapbook. The MFOL has been around for many years. Donations from book sales help buy books for the public libraries on Maui. You can also become a member of MFOL for $10/year, and of course, volunteers are welcome. Cagey Canadians Know Where to Shop, eh? In case of FIRE, save this bookmark! This Bookmark Rated M for Mature Readers. This is it! With my help, you've found your place again. It's like magic! If you'd like to have more pictures of the route to the bookstore, please check my post from yesterday about free paint at Community Work Day, which is located nearby. The sugar cane mill leases buildings for nonprofits, which is why Community Work Day and MFOL are located in the middle of nowhere. And why there is often a covering of red dust on all the books outside.. and sometimes the books inside get dusty too, especially near the front door. Nearby is old Pu'unene School, and other abandoned but historic buildings.